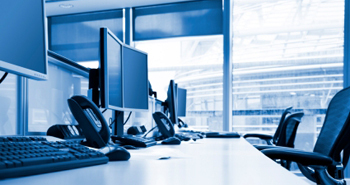 Setting up a new office or maintaining an existing one requires a number of essential technology and supplies, as well as furniture and other items needed for day-to-day operations. It is crucial to have sufficient equipment for the maximum number of workers expected on any given day. There should always be enough resources to accommodate staff without compromising productivity. There are a number of considerations in order to ensure day-to-day business requirements are met. Consider the geographic location and access to the office, including access by car and public transportation. Office requirements will also be defined by the number of employees and any special accommodation needs. Any decisions must also comply with health and safety regulations and requirements. The company's budget and the cost of office requirements will also influence decisions and the types of supplies and equipment purchased. Depending on the space, there may be amenities such as kitchens, lounges, car parks, conference facilities and rest rooms that will determine what is needed to support the office and staff. The type and size of work areas will also influence the furniture and equipment required, as well as any special communication and electrical requirements. Finally, the image a business wants to project will inform decisions on what is required for an office. The type of office equipment needed will depend on the type of business. Essential office equipment includes photocopiers, fax machines, scanners, postage metre, labelling machines, whiteboards and smartboards, fireproof safes for essential documents and valuables, paper shredders, and recycling and rubbish bins. Certain safety equipment is also needed, such as fire extinguishers, first-aid kits and an alarm system. The number and type of each piece of equipment will depend on the size of the company, operational requirements and the size of the staff. An office needs a range of communications equipment to keep connected. Offices require telephone lines and an internet connection. The number of lines and quality of the internet connection will depend on operational requirement. Other essential communications amenities include telephones, fax machines, and an answering machine or service. Businesses may also use cordless headsets and teleconferencing equipment, such as a speakerphone or conferencing unit. Servers may also be needed for certain businesses that maintain their own communications and IT services. Video conferencing equipment may also be used, including a television and camera. Mobile phones may also be assigned to individual staff members. Furniture choices will depend on utility and aesthetics. The type of furniture selected will help a business define itself and reflects the space where a company is based. For example, certain contemporary furniture may find itself out of place in a period building where heritage pieces might be better suited. Essential office furniture includes desks, chairs, filing cabinets, window covers such as blinds, bookcases, desk lighting, meeting tables and seating for common spaces such as a reception area. Decorative pieces might also be desirable. The type of furniture will also depend on the office layout. For example, partition walls may be needed for an office with cubicles while worktables would be needed for an open-plan layout. Offices will generally have computer hardware such as laptops or desktop computers. While desktops are stationary, laptops provide increased mobility in case an employee has to work from a remote location. In addition to computers, essential office computer hardware and accessories include monitors, keyboards and mice, computer locks, projectors, surge protectors, and CD writers. Other common items include printers and scanners. An office may also need a digital camera. The number of computers required will depend on the number of employees expected to be working on any given day. The choice and number of accessories is also relative to the number of computers and staff that they will support. The choice of computer software will typically depend on the nature of a business. Specialised software may be needed to support operations. Common computer software often required for any type of business include software for word processing, accounting, desktop publishing, email, contact management, virus protection, website building and maintenance, payment processing and inventory management. Graphic design, statistical and e-commerce software may also be needed depending on projects and day-to-day duties. Conferencing software may also be required for web, telephone or video based conferencing. General office supplies are used every day by businesses. Essential items include envelopes, stationary, pens and pencils, markers, printing and fax paper, file folders, notebooks and notepads, tape, staplers and staples, and scissors. Offices should also be stocked with cleaning supplies and common kitchen items, if the space is equipped with a kitchenette. Other common business supplies include USB data storage keys, CD disks and printer cartridges. Staff should also be provided with business cards, depending on their role.